I came home from Perth last night by way of Kinross and took in the open meeting about the National Curling Academy. Some seventy-five interested curlers attended in the Windlestrae Hotel. 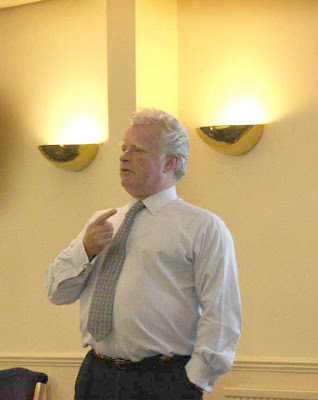 Jamie Montgomery outlined the history of the project. Significantly he emphasised that the Montgomery Hotel Group will have no involvement in the facility and no part in the running of it. 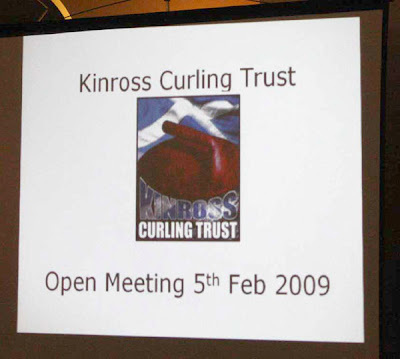 It will be run by the Kinross Curling Trust. I've talked about this in the blog (start here) and in the Scottish Curler magazine. A newsletter was sent out recently and is on the RCCC website, see here. The projected cost is £3.2 million. Of this £1.5 million is expected from sportscotland. The Royal Club and the RCCC Trust will put up £300,000. A bank loan of £1.0 million, and contributions of £400,000 from 'other sources' make up the total. The centre is not going to be a 'shed' - one would hope not with this price tag! Indeed, what it will look like is anyone's guess at the moment, as the plans for the building are just a blank page! It was announced last night that Turner and Townsend have been appointed as project managers. Ten companies applied, and five were shortlisted and interviewed. The design team has still to be put in place. When it came to question time, Steven Kerr, the current ice manager at the existing Kinross four-sheeter, voiced his concerns that the design team, whoever gets the brief, will be competent enough to provide a building in which a world class curling ice pad could be laid and used for most months of the year. The very fact that the biggest criticisms were being voiced by the local expert whose knowledge and expertise have apparently not been saught by those already involved in the project, is worrying to an outsider like me. On a more positive note, Alistair McCabe has been looking at needs of the users. The elite coaches at the Scottish Institute of Sport, the Royal Club and the Trust (which has the responsibility for the museum) have (or will be) consulted. Visits to Greenacres, the new Stirling rink, and to Curl Aberdeen have been arranged. The last facility is a good example of how mistakes can easily be made. No-one can deny that this is a fabulous rink, but remember the early problems with temperature control in the rink, and the lighting? Surely it should have been possible to get an even level of illumination over the full length of a sheet of ice! Yes, a competent design team is an imperative. The people who will benefit most from the new facility are the local curlers. If all goes as it should, they will get the best rink in Scotland ... and hopefully the best ice. There was some surprise that local curlers will be targeted in the fund raising. That idea was not in the original submission. Jamie Montgomery addressed this point at length. He feels that it will be important that the facility "retains a club atmosphere," and that having curlers' contributions to the project, "will give all a sense of ownership." He has a point, although it was noted that these contributions are "not a crucial part of the fundraising effort." Quite different then from the Cupar approach, see here. I have been following the NCA saga for seven years. That it might eventually happen is exciting. RCCC CEO Colin Grahamslaw outlined key dates. Design team appointed and working by late April. Planning application by mid-July. Contractor appointed by December. Building started by February 2010 and doors open in autumn next year. It got the biggest laugh of the evening! But it was obvious that Grahamslaw is serious about making the NCA a reality this time. He recognised the failures of the past. He said, "What we're trying to do is keep the momentum going." There was a plea for (local) people with the skills to come on board to help and push things forward. Let's hope they do. I continued my drive home rather more encouraged that I thought I might be. I really hope those with the vision are successful. I too was at the meeting and left feeling very sad - all those opinions and scathing remarks heard before and after the games...where were you all when you had the chance to voice your opinions? I wish Kinross Curling Trust and the National Curling Academy every sucess - you only have one chance to spend that amount of money and you have to get it right first time, maybe not looking for the things that have gone wrong with other sites but looking further afield i.e. Europe and Canada for the best information available from people who have actually built something similar and got it spot on - there is no margin here for errors especially with the time scale on the books.